Visitors to a circus performance in China recently got more than they bargained for. During a show at Qingdao Safari Park in the country's Shandong province, a young moon bear apparently decided he'd had enough of performing. As a surprised audience, including several children, looked on, the trainers fruitlessly tried to remove the incensed bear from the ring - but he wasn't having it. The keepers eventually tried to pull him off the stage by his neck, resulting in a minute-long tug-of-war as the cub repeatedly tried to escape from them and, in return, was harshly dragged across the concrete floor. Video of the incident was released on Chinese social media, and, according to welfare group Animals Asia, the condemnation from the Chinese public was swift. "I do not watch animal performance because I know the cruelty behind the 'happy' show," one person wrote on social networking site Weibo, according to a translation provided by Animals Asia. "Say no to animal performance," another wrote. In a statement, Animals Asia said that "it goes without saying that ... [we are] extremely concerned about what is seen in this footage." Unfortunately, the clip is anything but surprising. 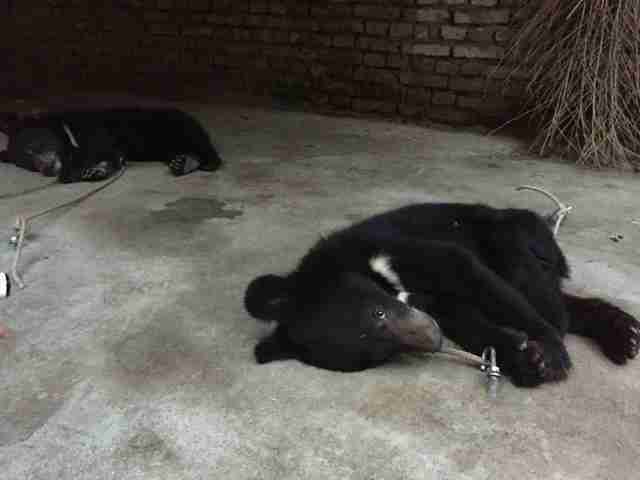 Previous investigations have shown that circus bears in Asia, much like in the U.S., are subjected to lives of heartbreaking cruelty. Torn away from their mothers as infants, they're beaten, kicked and choked to be made to perform. 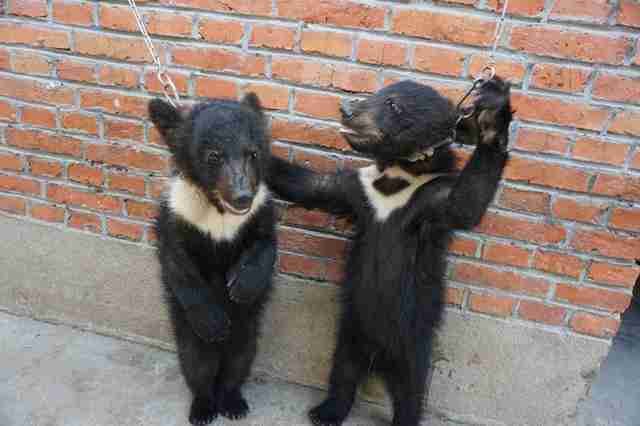 One sad clip showed how young bear cubs are trained to stand upright - attached by their necks to a wall with a short chain, they're forced to stand in the painful, unnatural position or risk hanging themselves. When not performing, the spend their lives in tiny cages with barely enough room to turn around in, never running free or experiencing the natural behaviors they were designed for. 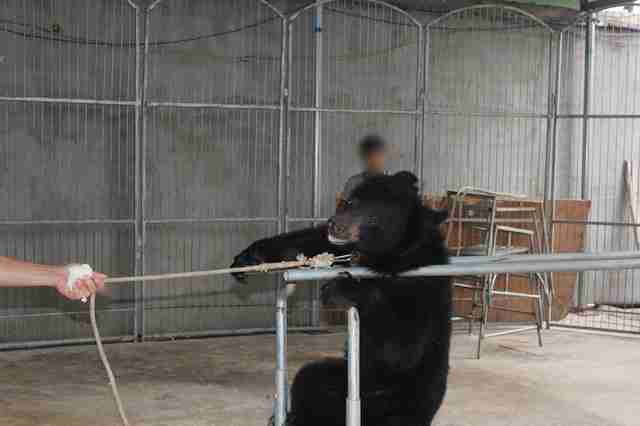 In this case, representatives with Qingdao Safari Park - which is run by the state - released a statement claiming that the bear was acting out because a nearby female bear was in heat, according to Animals Asia. 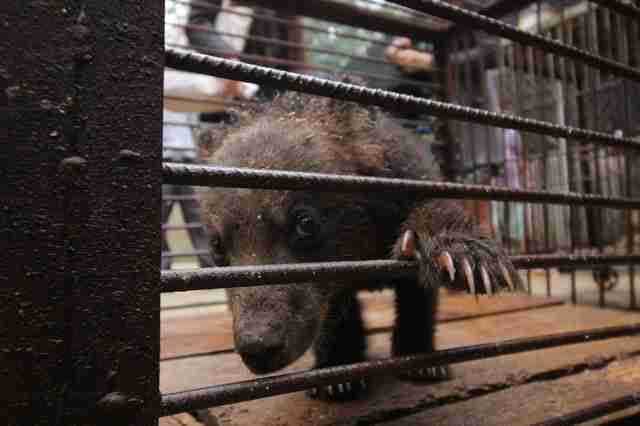 Officials claimed that, since the bear cub was "pushed" with a tool and not directly beaten, no abuse took place. Yet if there's a bright side to the heartbreak, it's that the public doesn't seem to be buying the safari park's excuses - which could indicate changing sentiments over animal welfare in China. "The social media reaction we've seen to this and other recent incidents is unprecedented and extremely heartening," Dave Neale, animal welfare director for Animals Asia, said in a statement. "Despite the video not being particularly graphic, Chinese netizens have been outraged, which shows how far advanced concepts of animal welfare have spread." "Most importantly this outpouring of public opinion has a very real chance of resulting in tangible change," he added. To help the hundreds of animals whom Animals Asia saves each year from situations like these - and continue the fight for animal welfare in Asia - you can make a donation here.